It's hardly uncommon. If you counted the number of sophomore albums simply called 2, 2.0, or II from rock bands over the last 40 years, you probably could buy a fifth of single malt whiskey, the good stuff from Scotland, and a case of very good craft beer to wash it down. So here' 21 Octayne with 2.0, now reduced to a three piece. It appears that bass player Andrew Lauer got kicked out the band for getting more chicks backstage than guitarist Marco Wriedt. It's just a rumor. What you have, the second time around, is more of 21Octayne's strong melodic hard rock, driven mostly by Wriedt's significant and creative guitar work and Hagen Grohe's equally strong vocals. It's a nearly perfect storm as the band weaves groove, harmony, and melody with, sometimes metalish, hard rock heaviness. Some may find some timbre of post-grunge in that weight. Than they embellish it with the gloss of simple AOR accessibility. In other words, the songs can be downright catchy at times like Lost, Take Me Back, Date With Myself, or the quasi-ballad Love's Just A Heartbreak. 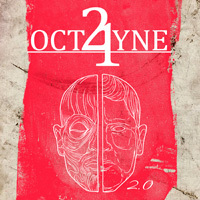 Alternatively, 21Octayne can bring more of that heavy metal thump with riff and drum rumbling Fly With Me. Then they get more than a little ambitious with Tale Of A Broken Child. At ten minutes, it works hard to keep your interest. The best part comes in the midpoint with some terrific drumming and large guitar work (which seems to be the point of the song). Basically, in the end, 21Octayne remains consistent and creative with their catchy and accessible, sometimes heavy, melodic hard rock. Recommended. 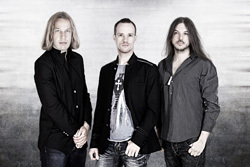 In the end, 21Octayne remains consistent and creative with their catchy and accessible, sometimes heavy, melodic hard rock. Recommended.